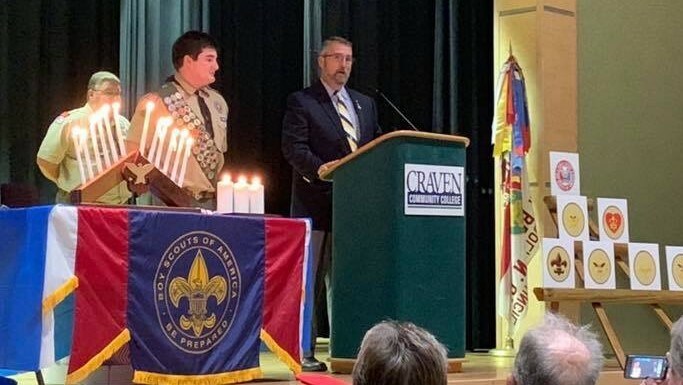 On November 26th, Troop 13 held an Eagle Scout Court of Honor ceremony for Nicholas “Nick” Potter at the Craven Community College in New Bern. 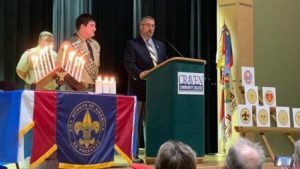 SAR New Bern Chapter VP Jay DeLoach is pictured presenting a Sons of the American Revolution (SAR) Eagle Scout Certificate of Recognition to Nick during the ceremony. Nick was the 8th Eagle Scout this calendar year for Troop 13 under the leadership of Scoutmaster Tim Mitchell who is featured in the background.